Halloween is a time to exercise your creativity and make something scary. These treats are not supposed to be cute and cuddly but quite the contrary, they should send shivers down your spine and result in goose bumps on your skin. Whether you are crafting menacing vampire brownies or a chilling spider web cake, it is clear that these desserts are not for the faint of heart. You still have a couple of days before Halloween so get out your mixer and bake some of these horrifying treats. Meringue cookies are light and air and are made from a whipped egg whites and sugar. When beating the egg whites, make sure your bowl and beaters are very clean (free from any fat) or else the whites will not become light and airy. While these mummified meringues look complicated, they are formed by simply piping the mixture straight onto a non-stick baking mat (like a silpat). 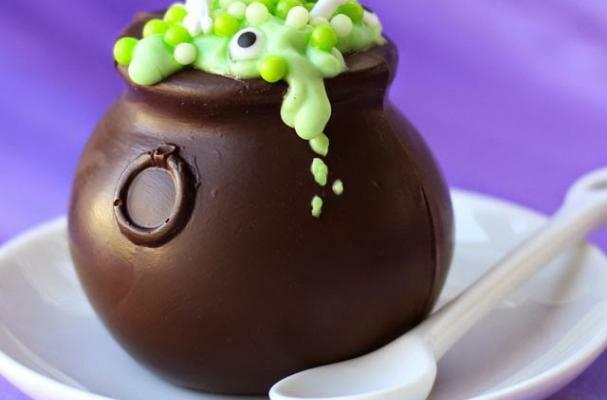 Even gluten-free eaters can get in on the Halloween fun with these amazing monster cake pops. For this recipe you can use your favorite gluten-free cake recipe made with an all purpose wheatless flour mix or if you are short on time, a boxed cake mix will do the trick. Have fun decorating these pops with Halloween inspired candy like edible candy eyes, bones, and black and orange sprinkles. Red velvet cake is usually a symbol of comfort but not in this case. Layers of moist burgandy colored cake are paired with a rich chocolate cream cheese frosting while a web of cream cheese icing is woven around the entire cake. A giant spider decorates the top, protecting the cake from wandering taste testers. Vampire bite brownies are a fun and easy Halloween sweet. Instead of using a typical brownie pan, these babies are baked in a mini muffin tin so that each person can have their own "bite." The brownies are topped with frosting and a gummy set of vampire teeth. "Double, double, toil and trouble " are the classic Shakespearean words that have continued to surround Halloween, especially where a witch's cauldron is concerned. This edible version is filled with pudding and good things to eat.